Why buy kimchi from your local supermarket when you can make your own? You can never be sure if it was made hygienically and with quality ingredients, nor can you be sure that it suits your taste. Moreover, supermarket kimchi is insanely overpriced! A small container of kimchi (about a pound, or 454 g) can set you back $3 or $4. With that much money, you could easily make triple or quadruple that amount of kimchi yourself! Yes, it’s time-consuming, but it’s fun, especially if you are a foodie or are interested in experiencing a bit of Korean culture first-hand — after all, making kimchi seems to be a very common activity in many Korean households, not to mention that kimchi is one of the representative dishes of Korean cuisine. Either way, once you learn how to make your own kimchi, you will never return to the generic supermarket kimchi! There is no turning back from homemade kimchi. Trust me. 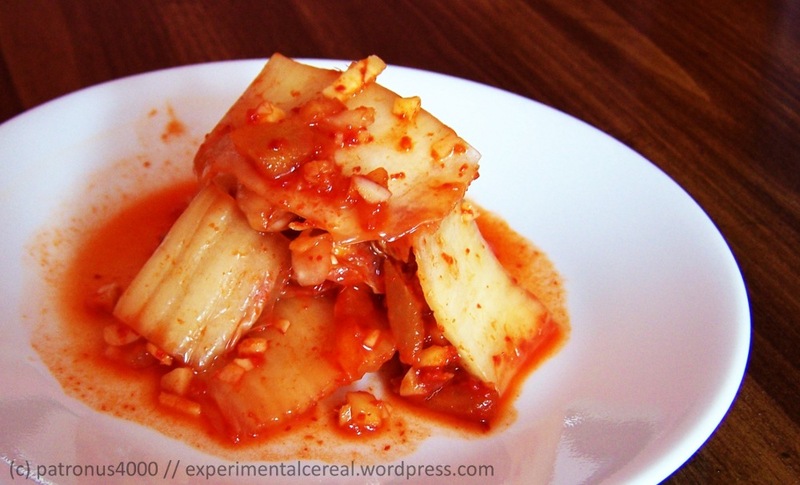 Here, I teach you how to make the most common form of kimchi — napa cabbage kimchi. I developed this recipe by taking elements from various other kimchi recipes I found on the internet, and by doing a bit of experimentation myself. Once you’ve mastered napa cabbage kimchi, feel free to experiment with other vegetables, such as Korean radishes, cucumbers, broccoli — the list never ends! A nonreactive pot to salt your cabbage leaves and mix them with sauce. By “nonreactive”, I mean that the material that the pot is made of must not react with the salt. High quality metal pots are usually okay, but to be safe, always use glass. Clean glass jars with lids. I use old jam or pasta sauce jars, washed thoroughly. It takes about 3 to 4 jam jars to store all the kimchi you’re going to produce with this recipe. Clean plastic gloves. Do not use the ones that you wear while washing clothes / mopping floors / cleaning dishes. Just, no. You’re making food here. Buy a new pair of gloves if you have to, and rinse them before sticking them into your kimchi! Separate the cabbage’s leaves, one by one. Cut off any parts that are brown or have holes in them — these leaves aren’t as fresh, and won’t make for great kimchi. Submerge all the good cabbage leaves in a large container — a clean sink or large pot will do fine — filled with cold water. This is to help the salt draw out water from them later. You could skip this step and go straight to salting, but then it would take longer to salt. Up to you. Take all the leaves out and drain them. Rub some salt onto each leaf, as if you’re marinating meat. You only need to salt one side of the leaf though, since they’re so thin. Put more salt on the thicker parts of the leaves than the thinner parts. About two teaspoons of salt should be enough for one fairly large leaf. Stack the salted leaves in a large glass bowl. Now, you wait. You wait for the salt to work its magic. Leave everything alone for two hours. Then, drain off any liquid that accumulated at the bottom, flip the stack of leaves over (so that the bottom leaves aren’t soaked in liquid all the time), and let everything sit for another two hours. Rinse your cabbage in cold water three or four times. For the first two times, I usually just pour cold water into the pot of salted leaves, shuffle the leaves around, and drain. On the third time, I actually take each leaf out and rinse it in water; I do this because a lot of salt gets trapped between the compressed leaves if all you do is shove the stack of leaves around in a pot of cold water. On the fourth wash, all the leaves just get a quick rinse in the pot. Lightly squeeze the leaves to get any excess water off. Stack your cabbage leaves neatly. This should be easy to do, since they’ve shrunk in size and are not as stiff as before. Cut the leaves into 1-inch wide strips. Put them all back into the now-empty pot. *If you try a piece of the leaves now, you should find that they’re not really that salty, despite having been sitting in salt for four hours. They should only taste slightly salty…but not as salty as the fries you find at McDonald’s. In a bowl, mix the hot chili pepper flakes with enough water to make a smooth paste. It should be about as thick as ketchup — you don’t want it too runny. Add the finely diced garlic, ginger, and apple; fish sauce; and sugar. Mix well. Add the spicy paste to the pot of chopped cabbage leaves, and give your leaves a nice aromatic massage! I suggest you wear a pair of clean plastic gloves to do this, to prevent the chili pepper from burning you. Make sure all the leaves are well-coated with the paste; if you feel that you don’t have enough paste to go around, add a little bit of water to it. *At this point, feel free to try a bit of your kimchi! While fermented kimchi is good, fresh kimchi is just as good. Yum yum. Just make sure you don’t eat all of it, because you do want to let some of it ferment! Pack your kimchi pieces into clean glass jars. Press the leaves down as you go, to make sure there is as little air in between them as possible. Remember, when fermenting foods, oxygen is your enemy! It will allow bacteria to grow and kill your tasty project. Also, pour any liquid that collected at the bottom of the pot into your kimchi jar. This is kimchi brine — it can be an excellent soup base, but at the moment, it fills up any remaining air pockets between the leaves and prevents bacterial growth. Important: Do NOT fill the jars all the way to the top though — leave about one to two inches of extra room. More juice will continue to leak from the cabbage leaves during the fermentation process, and you do not want your kimchi jars to be overflowing. Put the lids on the jars, but don’t screw them on tightly. You want to let the carbon dioxide escape the jar; otherwise, the jar will explode. No oxygen will get into the jars as long as you don’t open the lids. Leave the jars at room temperature for one to two days, to speed up the fermentation process, before transferring them to the fridge. They’ll continue to ferment in the fridge, but much more slowly. And that’s all! Feel free to eat your kimchi at any time! I find that it’s best after three or four days of fermenting, but it really depends on the temperature. Sadly, that nose-faucet comparison ends there. If only my nose could also develop an on/off handle, like an actual faucet, maybe I wouldn’t mind so much. It’s mid-August, school will be starting in less than a month, and I have a runny nose. It’s not a good thing. I’m hoping that it’s just seasonal allergies and not the onset of a two-week long cold — I do NOT want to be sick when classes commence. In fact, I can’t be sick at all — there’s so much I still have to do in these remaining weeks of summer, and so much I will have to do when school reopens. I would have chicken soup tonight, except, well, there’s no chicken, carrots, or potatoes at home. And there’s still a huge pot of stew that was cooked this afternoon. They say kimchi helps a cold. So, I’m going to make sure I have some of my awesome kimchi tonight…which reminds me, I shall post my recipe for it up soon. Maybe tonight.